When it comes to risk management, having a plan is the key to a safe, functional workplace. More often than not, most work-related incidents can be avoided by implementing a sound risk management plan. With risk comes uncertainty. And with uncertainty comes the potential for errors. It’s little wonder why then that the process of identifying and managing risks is an essential part of project management. Errors can be costly. They can not only affect the overall performance of a business’ operations, but also the health and safety of those involved. The trick is to devise a method to reduce the number of workplace errors. A set of instructions; a plan for those involved in the project. A plan that takes out the ambiguity and complexity of a given task or problem. and, that strategies and processes are in place in the likelihood of a risk materialising. Risk management plans are documents created by project managers that outline project risks, their potential impact on a project and define the responses used to control identified risks. Often the risk management plan is included in a Project Management Plan or Business Plan, but it may be maintained as a standalone document for large, complex projects. So, why is a risk management plan so important? 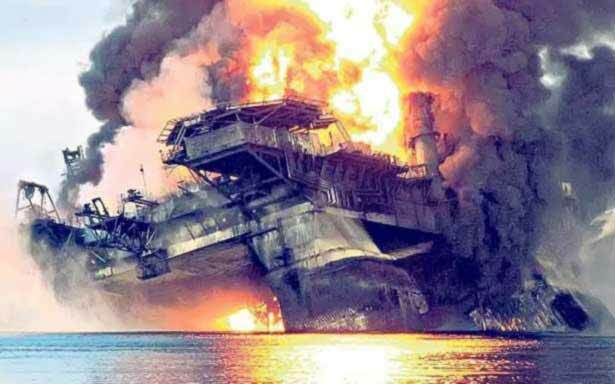 The Deepwater Horizon disaster - which resulted in 11 fatalities and 5 million barrels of oil being spilled into the Gulf of Mexico - was brought on due to a series of risk management failures. Perhaps the biggest thing come from the fallout of such an event was the failure to notice and react to the “warning signs”. The simple things that could have been done to prevent this disaster show just how important implementing and following risk management protocol is. No matter how carefully you plan your project, you will likely run into unexpected issues at some point. 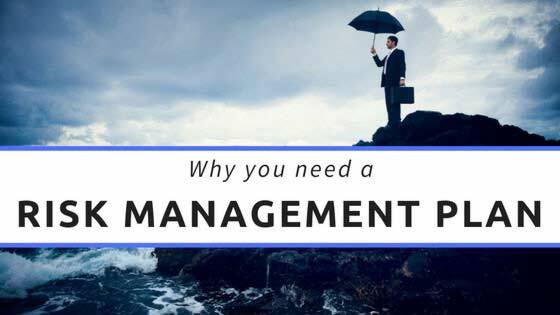 The purpose of the risk management plan is to identify these potential issues when they are still risks, and develop strategies to deal with them. When do you need to develop a Risk Management Plan? Short Answer: Straight away! Start your risk management planning process as soon as a project is initiated. Longer Answer: Your approach to managing risk will change depending on the phase of the project. Project initiation represents the project stage with the most risks; the majority being unknown risks. 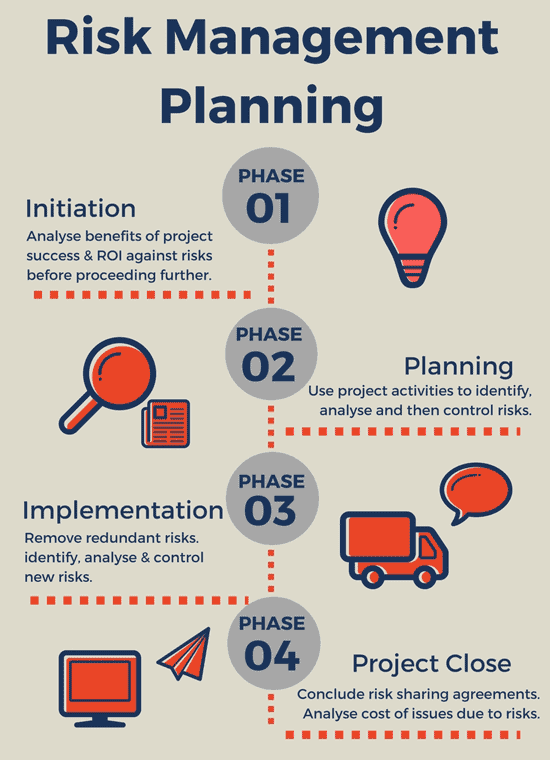 The primary purpose for analysing risks in the initiation stage is to weigh the benefits of project success and ROI against risks, to help decide whether a project should continue into the planning stage. In this phase, you should begin to identify risks based on planned project activities - You can use the project's Work Breakdown Structure (WBS) as a guide. Your Risk Management Plan should have all key information and an initial risk register completed by the end of this phase. As a project progresses and tasks are completed successfully with no loss, the number of project risks will reduce. The Risk Management Plan should be reviewed on regular intervals during this phase (as documented during the planning phase) to assess risks that are no longer relevant and to identify new risks which may have arisen. Make sure you utilise a suitable method of document control to manage your risk management plan documentation! At the project close, risk transfer/sharing agreements should be concluded to avoid disputes between external parties and all existing risks should have been mitigated or avoided. A final estimate of the cost of issues due to risks occurring can be made and added to your project documentation. Outline how you will respond to risks. 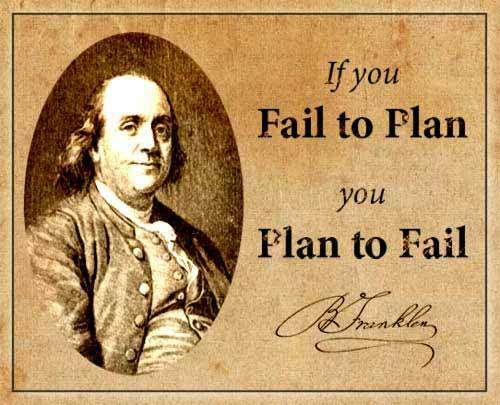 As Benjamin Franklin once said, “Failing to plan is planning to fail”. The main thing to take away from events like the Deepwater Horizon disaster is that planning is the key to mitigation. And a failure to plan can be catastrophic! What we have found is that during the life-cycle of a project, you can practically implement risk plans at any stage. The risks during each stage may change and require different approaches. Outlined above is a rough template as to how you should structure your plan. However, as to how go about implementing these steps is completely up to you. By breaking down risk management into smaller, manageable steps, you can decrease the likelihood of a risk materialising, and effectively eliminate (as best you can) the likelihood of catastrophic events.